Brunette woman walking in city centre, Roman Forum. Female tourist takes photo of old town and musician. Attractive girl walking alone in the old town. Brunette woman going through the street. Female have vacation in Europe. 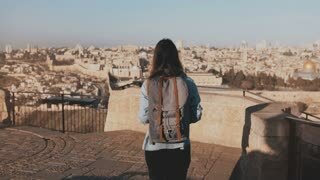 Young girl with backpack enjoys Jerusalem panorama. 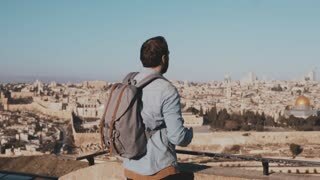 Thoughtful European tourist looks at ancient old town in Israel. 4K. 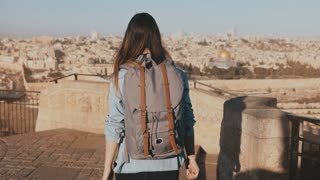 Woman with backpack comes up to Jerusalem panorama. 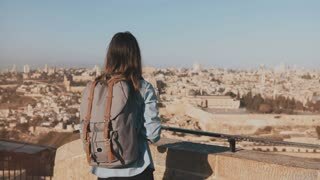 Excited Caucasian tourist looks at ancient old town in Israel. 4K. Female tourist takes photos of Jerusalem old town. Pretty Caucasian traveler woman smiling with backpack. Israel. 4K. 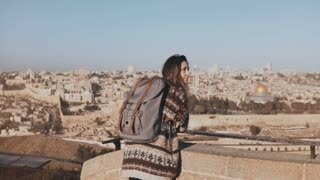 Girl with backpack walks to see old Jerusalem town. Excited European tourist raises hands joyful and happy. Israel. 4K. Happy Caucasian girl runs, arms wide open. View of Israel, Jerusalem old town. Excited female tourist. Slow motion. Happy European tourist female raises hands. Israel, Jerusalem. Girl with backpack walks to see old town panorama. 4K. Tourist girl takes photos of old town Jerusalem. Girl with backpack walks to skydeck edge. Capturing moments. Israel 4K.